The data center industry is at a crossroads. The types of data centers that will come online in the future may feature attributes much different than what was the status quo in the past. Upon examination of the entire data center fleet, the installed base of data centers is shifting away from internal data centers, with service provider data centers taking a leadership position from this point forward. And resiliency is key to success — which is why alternative energy options — like advanced microgrids — are being considered. Given the risk profile of data center operations, it is paramount that if a data center operation wishes to outsource its energy asset management tasks to a third-party, it chooses wisely. Advanced microgrids incorporate the latest hardware and software innovations to meet today’s data center resiliency requirements at a lower TCO. Data centers are moving away from direct ownership of hard assets and seeking resiliency and efficiency via the cloud and the virtualization of energy services. This is setting the stage for creative solutions providers to offer up new technologies via new business models that can mitigate risks while increasing performance through options like advanced microgrids. 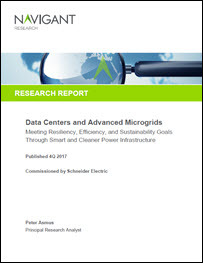 Download the new Schneider Electric white paper, conducted by Navigant Research, that explores the implications of technology like advanced microgrids and the cloud on the data center industry.